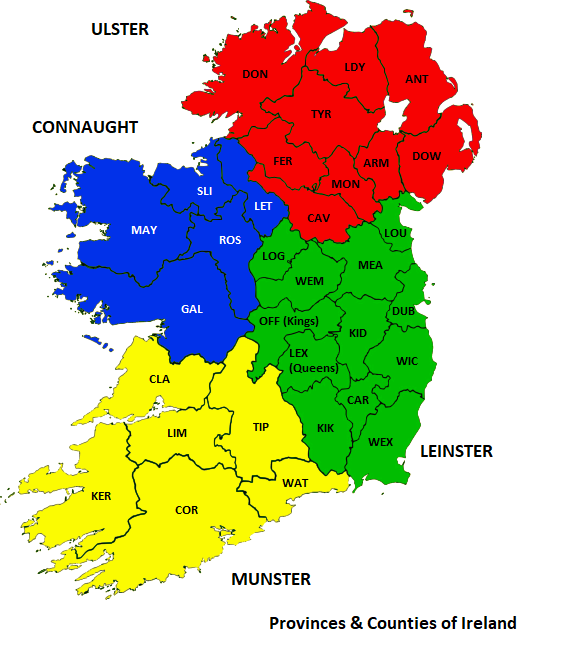 Historically, Ireland had 4 Provinces - Ulster, Connaught, Leinster and Munster. You may find some records arranged under these categories on some websites. Fans of Irish rugby and GAA sport will be well aware of these names! Antrim, Armagh, Cavan, (London)Derry, Donegal, Down, Fermanagh, Monaghan, Tyrone. Galway, Leitrim, Mayo, Roscommon, Sligo. Carlow, Dublin, Kildare, Kilkenny, Laois/Leix (aka Queens), Longford, Louth, Meath, Offaly (aka Kings), Westmeath, Wexford, Wicklow. Clare, Cork, Kerry, Limerick, Tipperary, Waterford. The county labels in the picture to the right are Chapman Codes - these can be a useful shorthand to use when you need to use the county name in source citations or image filenames for example. You might also find them used in some online database e.g. the IGRS Early BMD indexes and the Registry of Deeds project. There are similar codes for all the other historic counties of the British Isles (see link above), which you might also find useful for non-Irish citations. For more information about the counties, which formed over an extended period, see Counties of Ireland.